Robert Maurice DiPofi, Sr., age 79, passed away on Wednesday, March 21, 2018 after a short illness. Bob was born in Conneaut, Ohio on February 22, 1939, the son of Maurice and Elizabeth (Mulcahy) DiPofi and was a lifelong resident of Conneaut. Bob was a 1957 graduate of Conneaut High School and earned Varsity letters in basketball and football. He was given the nickname “Toe” because he was the place kicker for the football team. He also played little league baseball at CLYO, for the Conneaut American Legion team, and in later years played slow pitch for Koehler Beer. Bob was honored that the Slow Pitch League at Lakeview Park was renamed The DiPofi Slow Pitch League in the memory of his brothers and father. Bob received his “master barbers” license in Erie, PA at the Ora Jean Academy of Barbering. He first went to work at Whitey’s Barber Shop in Conneaut and then accepted a position with Dominic Iarocci in Ashtabula. Bob bought out McDonald’s Barber Shop that was located next to the former Sugar Bowl on Main Street and barbered there until a city hall expansion had him relocate his shop to his home residence in 1986. Bob retired from the profession in 2016. Bob loved his family and followed their accomplishments and interests. He enjoyed the Cleveland Browns and Cleveland Indians, took great pride in keeping his yard looking nice, enjoyed time he spent having coffee with his friends at McDonald’s, and attended Geneva High School girls’ basketball games while his son, Rob, coached there . He is survived by his son, Robert and Elaine (Crozier) DiPofi, Jr., granddaughters Gillian Laine, Aubrey Lynne, Mackenzie Louise and Addison June DiPofi of Geneva, Ohio, a daughter, Kara Louise (DiPofi) Lee of Conneaut, Ohio and grandson Ryan Jeffrey Lee of Conneaut, Ohio. He was preceded in death by his parents, Maurice and Elizabeth DiPofi, brothers Denton and David DiPofi, and his wife of forty-nine years, Janice (Burger) DiPofi. Calling hours for Bob will be from 4:00 p.m. to 6:00 p.m. on Saturday, March 24, 2018 at Raisian Family Funeral Home, 581 Harbor Street, Conneaut. Burial of his ashes will take place at a later date. In lieu of flowers, memorial donations if desired can be made to his family. Envelopes will be available the funeral home. 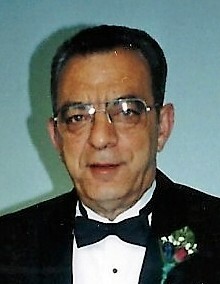 The family of Robert M. DiPofi, Sr.